It's been way too long. Too long since I've written here, and too long since I had a ride worth writing about. As it turns out we had a long weekend, so I decided to make time for a long ride. I've been irregularly commuting, and through that I've been getting lots of miles on the bike, but it's been far too long since I enjoyed the mountain roads. So after watching the Tour de France stage this morning, I started off just before 09:00. I didn't have a fixed plan, but I did want to see what was happening at the washout on Highway 35, which at the time looked impossible to repair. Toward that end I headed up Black Road, then turned right on Summit until I saw the "Road Closed" signs. As it turns out the construction crew also had a vacation day, so it was quiet. Construction at the Highway 35 washout... I think. Looking at the original shots, it wasn't clear whether they would reconstruct the road in place, or reroute since so much of the hill had disappeared. This construction clearly rebuilds the road in place, but the area is so transformed that it's hard to believe it's the same place. Where there two major construction areas on 35? In this area there's already a single lane running through, and major drainage improvements going on. this one on Bear Creek Road. I didn't expect to be able to pass through, and I stuck with the loose plan to head down to Boulder Creek for lunch. Bear Creek Road had several areas in which the road narrowed to a single lane, which obviously was going to be a theme for this ride. When I got down to Boulder Creek I learned that Foster's Freeze is closed on Mondays, which was certainly a disappointment. I wanted to head up via either Zayante or Mountain Charlie Road, so I headed down Route 9 in the company of much traffic. I got a flat (steel belt wire) near Brookdale. I stopped in Felton at Mountain Roasting for a very good consolation sandwich. 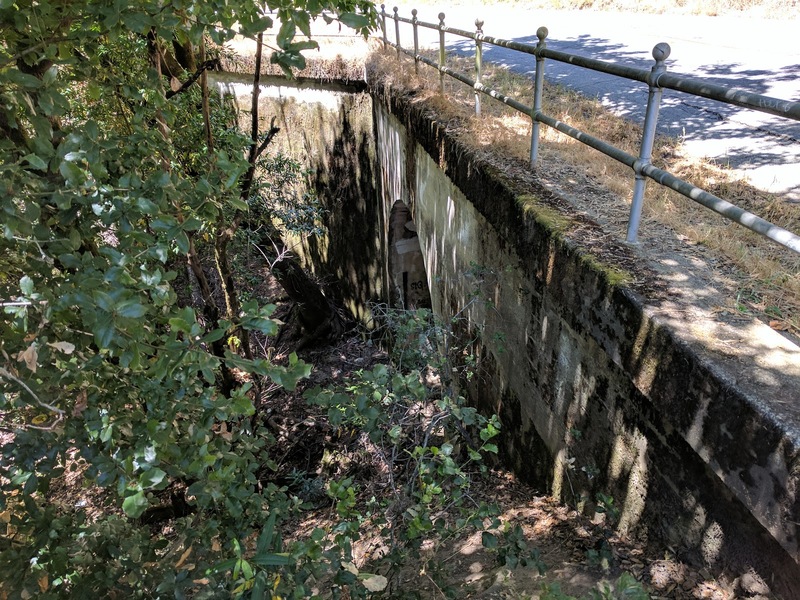 I decided to continue down to Mountain Charlie Road, in part because I had recently looked up where the Laurel tunnel exits under Glenwood Drive, and wanted to see that. I headed that way on Graham Hill Road, which until then I hadn't known was a steep climb out of Felton. My commuter legs were definitely feeling it. 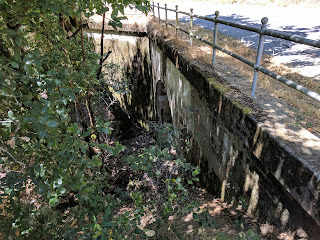 The Laurel Tunnel entrance under Glenwood Drive. It's just north of Eagle Road, for the record. I enjoyed Bean Creek Road, then continued on Glenwood past Mountain Charlie Road to see the tunnel entrance. Except, despite knowing what to look for, I rode right past it. 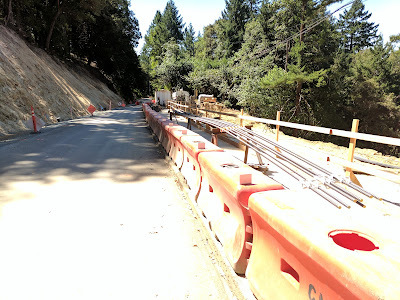 I ended up seeing much more of Glenwood Drive than I intended, but that was interesting on two counts: first, the road surface became the twin of Old Santa Cruz Highway just to the north, skinny and concrete. That's fitting because this was indeed part of that path before Highway 17 was built. The other thing I noticed was that there were lots of cyclists on this stretch of road. That part I don't understand; to my knowledge this road, while quite pretty, dead-ends at Highway 17. What's the attraction? What have I been missing all these years? I went back to Mountain Charlie Road and headed back toward home, the heat now conspiring with the length of the ride to drain my already-meager energy. 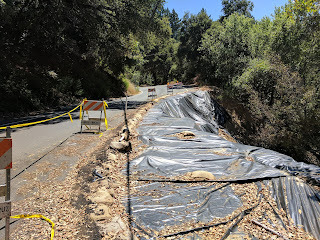 Among all the damaged roads I had been riding all day, Mountain Charlie Road was a survivor, with relatively little damage despite its many overhanging hills and trees. Today's ride was just over 70 miles, with 6100 feet of climbing. The most difficult kilometer of the ride was in the second half of Black Road, which averaged about 11%. The kilometer of Graham Hill Road, leaving Felton, was close at nearly 10%, but felt worse due to the heat, the traffic, and the recently-eaten lunch. It was great to get back into the mountains, but what became clear to me is that I'm not in the same kind of shape at all. First, I haven't done any climbs recently, and no long climbs for ages. Second, my commute is less than two hours of riding, so I can easily ride full-out. That's a lousy strategy for a longer ride, and one with climbing. Pace is the key for old, slow rider.